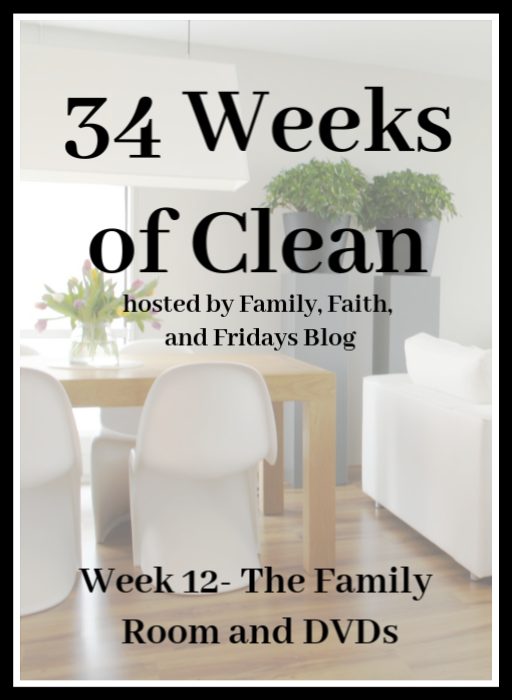 So for this week's assignment we are headed to the family room. Or den. Or whatever you choose to call the place where you spend time as a family. Ours is currently in our basement and does not get as much traffic because of that. It is, however, a hang out place for the kids and their friends, and is where we retreat to on hot days to stay cool. It has even hosted a group of about 15 boys for a youth function! First things first, so clear out the clutter. One of the things that seems to happen when we stay in one place for any length of time is that we collect things in piles. Somehow those piles just grow in layers and we start to not even notice the piles. Now is the time to notice the piles! And get rid of them! Take everything out of the room that you can for now. You can put it back (some of it, that is) after we deep clean! I know it takes a lot of effort, but by starting with a clean slate, you can better see what your needs are. It is also a pretty stark reminder of how much STUFF you have accumulated without even noticing. We have an obvious obsession with quilts! Start at the top with lights and ceiling fans. Oh my word, those things can get dusty! Now on to the dusting! Bet you will be surprised at how dusty the tops of things are. A good waxing of hard furniture will keep it looking like new! With all of your shelves empty, this is pretty easy to do. - Don't forget to dust or wash any artificial plants or flowers. Helpful hint, if you leave them out to dry, make sure you put them out of reach of DUMB dogs who think they look good enough to eat! Yep, that has happened! More than once. Don't forget to wipe off or vacuum lampshades and wipe down light switches! On to the soft furniture. One sure fire way to tell you have kids is to check the nooks and crannies of your couches. YUCK! You never know what you will find there! (Nerf darts, anyone?) If you have slipcover type furniture, I would encourage you to wash them. Just think about how many sweaty bodies have sat on them in the past year. Leather polish will help restore any leather furniture as well. Wash any throws and pillows you have, and replace only what you really love and use! Floors and baseboards are next. Mop, vacuum, whatever it takes! It is time to put things back. Challenge yourself as you do this! Ask yourself, do I love this or need it or use it? Why do I have it? Is it just taking up space? You will notice our space is pretty clear of nick knacks. Most you will find on this one built in. On purpose! Less visual clutter equals less stress. The space is calming and just houses the things we love. And now the fun part. NOT! This is the area we house our DVDs, so guess what? We are clearing out DVDs. Luckily, Riley is the queen of movies and loves to organize them, so she does this every time she comes home to visit. Last year I finally got brave, bought these CD binders, and ousted all of the DVD cases. Let me just tell you, that was HUGE for me. The kids had been suggesting it for years, but I just didn't want to give up all those pretty cases. Lame, I know. So I had them cut off the picture and stick it behind each DVD- one so I could still see them, and two, so they are easier to put back where they belong, which keeps Riley happy! Before you walk away with a smile on your face for a job well done, take one last look around! Do you have stuff just filling a space? Do you love everything you see? Does it have a purpose? 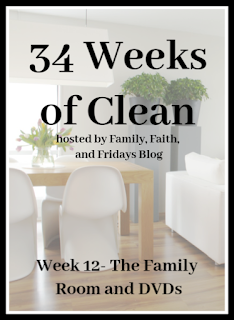 Because 34 Weeks of Clean is just not about cleaning, but also about taking back our homes in the clutter department, I challenge you to get rid of extras. If you don't love it or use it, lose it! Time to clear out the clutter! Everything you have sitting around takes up space- physical and mental. Surround yourself with only the things you love- move out the rest. See ya back next week!